Combine beer and steak sauce in 1-cup glass measure. Cover and microwave on HIGH 1 to 1-1/2 minutes or until bubbly. Lightly shape ground beef into four 3/4-inch thick patties. Place patties in center of grid over medium, ash-covered coals; arrange onion around patties. Grill, covered, 11 to 15 minutes (over medium heat on preheated gas grill, 13 to 14 minutes) until instant-read thermometer inserted horizontally into center registers 160°, turning occasionally. Season with salt after turning. About 2 minutes before patties are done, brush generously with sauce; top with cheese. Serve burgers and onions in rolls with lettuce and sauce. 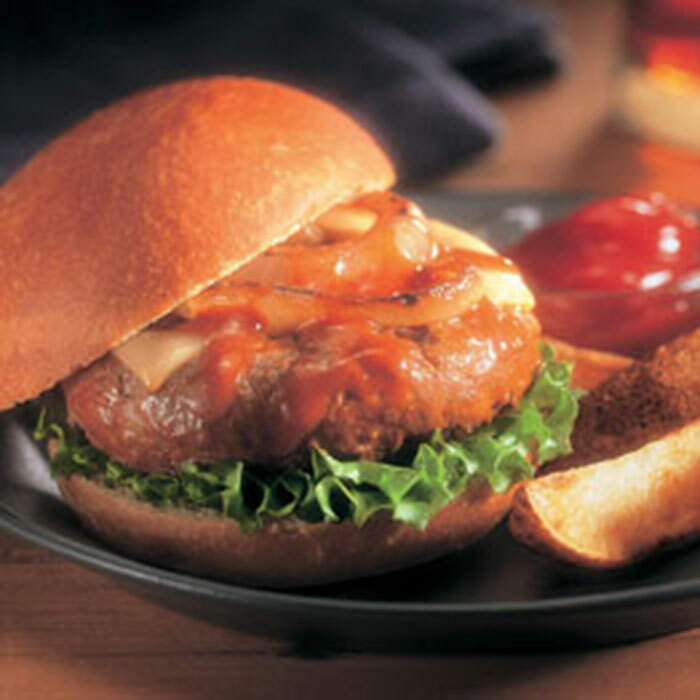 Recipe and photo courtesy of the Beef Checkoff, http://www.beefitswhatsfordinner.com.